Studio Athletica | Downtown Toronto Ankle Physiotherapy - Call Now. Below you will find a list of some conditions that we see with our Downtown Toronto ankle physiotherapy clientele. At Studio Athletica, we specialize in several different services that can help treat your health problems. Whether you participate in sports, weightlifting, or lead an active lifestyle, it is not uncommon to sustain injuries or feel some degree of discomfort or pain due to overuse of the muscles, bone, and tendon in this area.. At Studio Athletica, we specialize in several different services that can help treat your health problems. Please feel free to read more about your symptoms, conditions and our suggested treatments, or contact us to pinpoint the best treatment to heal your body. The downtown Toronto ankle physiotherapy program is the gold standard. Our Downtown Toronto ankle physiotherapy program sees a lot of sprains & ligament tears.A sprain occurs when the threads or fibers of the ligament are torn or stretch. 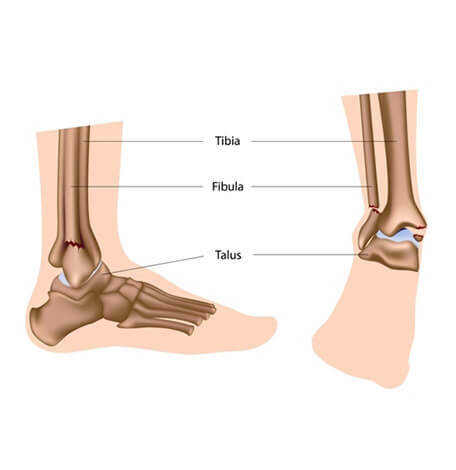 In order for the ankle to function correctly, it uses the ligaments and bone to help bend the foot. When a ligament gets torn or sprained, moving the ankle becomes very difficult or sometimes even impossible. While these injuries can occur in people of any age, these strains and tears are some of the most common in people who participate in sports or vigorous workout routines. This is because certain types of physical activities will put additional strain on the joints. 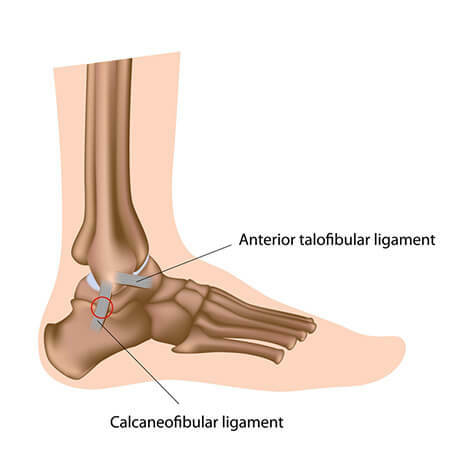 Depending on the severity of the ligament tear or sprain, the symptoms may include: A sudden popping or snapping sound when the injury occurs, swelling, tenderness, and difficulties moving the ankle. Our Downtown Toronto ankle physiotherapy program sees a lot of high ankle sprains. High ankle sprains are less common, however this condition is more disabling than your typical lower ankle sprain. 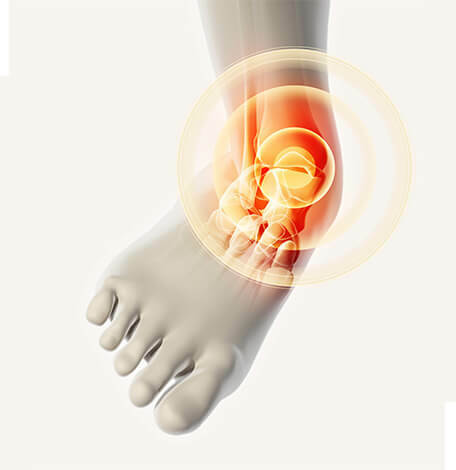 A high ankle sprain is an injury to the higher ankle ligaments, which are located above the ankle joint. High ankle sprains mostly occur when the foot is planted on the ground and followed by a severe outwards twisting motion of the foot. Pain will be felt right above the ankle that will worsen with outward rotation of the foot. Also, pain when walking is expected with significant bruising and swelling toward the higher ankle, rather than near the malleolus. Our Downtown Toronto ankle physiotherapy program sees a lot of osteoarthritis. Osteoarthritis is the most common form of arthritis. It occurs when the protective cartilage on the ends of your bones wears down over time. It can occur with any joint in your body however, the disorder most commonly affects joints in your hands, knees, hips and spine. The symptoms of osteoarthritis are manageable despite the fact that the underlying issues cannot be reversed. Adopting healthy eating habits, staying active and other helpful treatments, may slow down the development of the disease and help to alleviate pain and improve joint function. The symptoms include pain in the joints during or after moving, tenderness when applying light pressure to the joint, stiffness, loss of flexibility, grating sensation in the joint, and bone spurs. Our Downtown Toronto ankle physiotherapy program sees a lot of fractures. A fracture is a broken bone. At times, a fractured ankle can also happen simultaneously with a sprain because the ligaments may also be torn at the same time that the injury occurred. Ankle fractures are very common and can be caused by an ankle being forcefully bent side-to-side or from a lot of force being applied straight down onto the ankle. For instance, jumping from a high level and landing on the ankle the wrong way. A fractured ankle will be difficult to apply pressure to, therefore, walking will be painful as well as evident swelling and tenderness. Our Downtown Toronto ankle physiotherapy program sees a lot of tendinopathy. 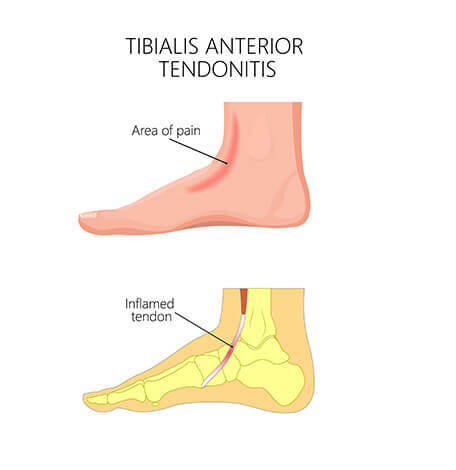 Tendinopathy refers to an injury to the tendon. Tendons are the tough fibers that connect muscle to bone. Most tendon injuries occur near joints, such as the shoulder, elbow, knee, and ankle. Tendinopathy in the ankle will affect the achilles, tibialis, posterior and peronei. It’s a condition that will cause pain and swelling to the the tendons that join the heel bone to the calf muscles. Runners and those who play sports that involve running will typically suffer from this condition due to overuse of the tendon. People who suffer from achilles tendinopathy will have difficulties running, even walking, and the ankle may be swollen and tender to touch.